The Community Education office at Eastern Wyoming College in Torrington is partnering with Scottsbluff DaVita to bring the following class. Kidney Smart will be held on Mondays, May 18th, June 15, July 20, and August 17 from 6-8:00 pm. This class will be held in the EWC Community Training Center and there is no cost for the class. Kidney Smart is an education program concerned with chronic kidney disease (CKD). It is focused on helping patients and families understand and manage their kidney health. Launched in June of 2012, Kidney Smart provides no-cost CKD classes to tens of thousands of patients each year across the country, fostering healthier and more prepared kidney patients. This class is available to patients, family members, medical staff and anyone who would like more information on chronic kidney disease. The class may be repeated as many times as a person would like, again at no-cost. To register for a Kidney Smart class contact the EWC Community Education office at 307.532.8323 by 3:00 pm on the day of the class you would like to attend. 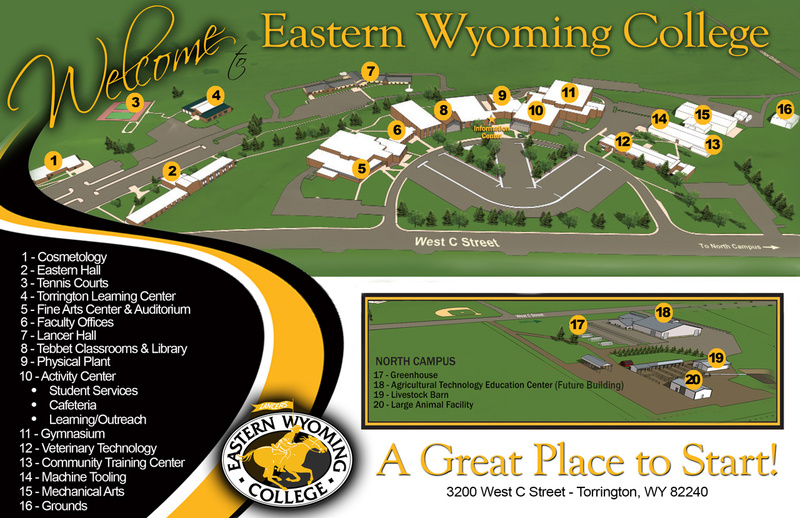 Eastern Wyoming College is pleased to announce that the 66th annual commencement ceremony will be held on Friday, May 8, 2015 at 7:00 pm in the EWC Fine Arts Auditorium in Torrington, Wyoming. Commencement activities will begin with a barbecue for graduates and their families in the Student Center at 4:30 pm on Friday, May 8th. The commencement ceremony will begin at 7:00 pm with a processional provided by Janet Howard, Pianist. Dr. Dee Ludwig, Vice President for Learning, will serve as the Director of Ceremonies. The National Anthem will be sung by EWC Student Callie Pearson. Dr. Rick Patterson, President, will then provide a welcome and introduce special guests. Mr. Zach Eisenbarth, EWC Student Senate President, will provide a welcome on behalf of the students. Eastern Wyoming College Foundation President, Patrick Korell will then present the 2015 Distinguished Alumnus Award and the 2015 Albert C. Conger Distinguished Service Award. Dr. Dee Ludwig, Vice President for Learning, will present the candidates for graduation. Following will be the presentation of certificates and degrees by Ms. Angie Chavez, President of the EWC Board of Trustees. Closing remarks will be spoken by Dr. Ludwig. A ceremony will be held to honor the High School Equivalency Certificate graduates on Thursday, May 7, 2015 at 6:00 pm in Tebbet rooms 131-132. The Eastern Wyoming College Diversity Club recently held a fundraiser celebrating Military Heroes at a Lancer basketball game. The Diversity Club is sponsored by Patsy O. Velazquez and Dr. Dee Ludwig and is a group of twelve students whose goals are to: Broaden world view of students and staff; Provides social interaction and fun; Enhance thinking and appreciation of others; Increases understanding of diversity; Enhances teamwork among all. Student members have family who are veterans or are actively serving and wanted to hold a fundraiser to raise money to donate to a local Veteran Organization and a program to help injured veterans. A total of $1,203.10 was raised. The club donated 902.33 to the Veterans Administration Medical Center in Cheyenne, WY and $300.77 was donated to the Wounded Warrior Project. “We were very pleased with the response from the community and thank everyone who attended and supported the event,” said sponsor Patsy Velazquez. “The Diversity Club sponsored a variety of activities over the course of the year. This one had a lot of buy-in from the club members and the College as a whole. We had hoped to raise about $1000, and we exceeded our goal for this worthy project,” added Dr. Dee Ludwig. The Eastern Wyoming College golf team finished 2nd at the Northeastern Junior College Tournament held April 16-17 in Sterling, CO. The wet and cold tournament was in Sterling, CO. EWC golfers played very well in this wet and cold tournament on the second day to make a strong run at first place but fell short. “It was a fun day to be on the course despite the conditions because all of our golfers were playing well and had fun. I have been very proud at how well these student athletes have played this spring, it’s been a fun and rewarding stretch of tournaments” said golf coach Zach Smith. Logan Harrison, freshman from Cheyenne, WY made another solid bid for his 3rd straight first place finish but fell short by 1 stroke to finish 2nd with a team best 145. Sophomore Josh Wilson from West Haven, Utah also had another strong tournament and finished 4th with a 147. EWC will wrap up the 2014-2015 season when they host their tournament April 23-24 beginning at 1:00 pm Thursday and 8:00 am on Friday morning depending on the weather. The Music Department at Eastern Wyoming College has announced the Spring Concert will be held Wednesday April 29 at 7 pm in the Fine Arts Auditorium. The concert is free and open to the public and will feature the EWC Collegiate Chorale, Community Chorus, EWC Jazz Combo, both EWC College and Community Band. The Eastern Wyoming College Booster Club invites you to the Athletics End of Year BBQ. The event is scheduled for Wednesday, April 22, 2015 in the Rendezvous Center at the Goshen County Fairgrounds in Torrington, Wyoming. The end of year event is designed to honor our EWC student-athletes, parents, adoptive parents, support staff, administration, board of trustees, boosters and fans. Terri Luttrell of Cottonwood Catering will be preparing a BBQ dinner with a variety of meats, BBQ sauces, potato salad, coleslaw, baked beans, potato chips, desserts and a variety of drinks including Pepsi products. We will provide dinner for the first 250 guests Wednesday evening. Following dinner there will be a few comments from the EWC Athletic Department and Booster Club followed by a presentation from each EWC Head Coach. The coaches will provide a season recap with highlights and recruiting updates. “Together we have accomplished many goals as an athletic department and booster club this year. Our student-athletes and coaches have worked hard to enhance the EWC experience. We look forward to the opportunity to celebrate the year with our key stakeholders,” noted David Vondy, Director of Athletics. The EWC Booster Club would like to thank Pittman Electric, Bob’s Roofing, Cottonwood Catering, Pepsi and Goshen County Fairgrounds for their support of this year’s EWC Athletics End of Year BBQ. The Eastern Wyoming College debate team traveled to Boise Idaho to compete at the International Public Debate Association (IPDA) National Tournament on March 27th. The tournament was one of the largest in (IPDA) history, boasting over 250 competitors and 94 within the novice debate bracket. Torrington’s own, Thomas Garvie, sophomore, tied for 9th in the country in the novice bracket and earned Eastern Wyoming College their highest national ranking in debate team history. After 8-grueling preliminary rounds of debate, Garvie ended up winning 6 out of 8 debates, and in the first round of the tournament, narrowly losing to the national champion, Stanfield from Middle Tennessee State University. According to Garvie, “It’s an amazing feeling to match wits with the best debaters in the country and to know that you are among an elite group is rewarding and humbling.” EWC’s debaters were only bested by one other community college (Lee College) and have solidified EWC’s position amongst the best Colleges and Universities in the country. Other debaters that had a successful national tournament were Emily Ellis, freshman, Carpenter, WY and Bryce Funk, freshman, Merino, CO, who ended up ranking 50th and 51st respectfully. According to Hansen “Both Emily and Bryce showed exceptional gains this year and it’s exciting to have them back next year as they will work hard to move-up in the national rankings.” Also traveling were novice debaters Will Anderson, freshman, Torrington, WY and Callie Pearson, freshman, Torrington, WY who put up impressive wins against the College of Western Idaho and Bossier Parish Community College. Additionally, Drew Buckhaults, freshman, Hawk Springs, WY competed in the novice division and showed impressive gains earning 142 speaker points. Moreover, EWC showed great promise in the varsity division, thanks to Kyle Sabourin, freshman, Farson, WY who competed against the most experienced debaters in the country and winning three of his debates and defeating debaters from Boise State University and Louisiana State University – Shreveport. Eastern Wyoming College presents EWC Art Instructor John Cline speaking on Art and the Nazis and the effect Nazism had on art in both Europe and the United States. This presentation is free and open to the public and will take place on Wednesday, April 15th at noon in Lecture Hall 1 in the Fine Arts building. For more information please contact John Cline at 307.532.8291.